In Bulls, I fuelled up and watched plenty of other bikes go past while I waited for the guys to arrive and get their juice. It was already warming up. The trip up the valley was its normal spectacular self but yes, the dust was a problem and we did spread out quite a bit. Being summer the road was pretty hard and the gravel fairly "marbly" under our tyres. A lot of the corners were pretty corrugated too - the Tenere was not enjoying the corrugations with the traction control constantly kicking in and affecting drive. It actually becomes a vicious circle with the power being cut, then coming on strong, only to cut again straight away - quite annoying and it definitely slows things down. After our first stop I knocked it back to the 2nd setting and it was a lot smoother. 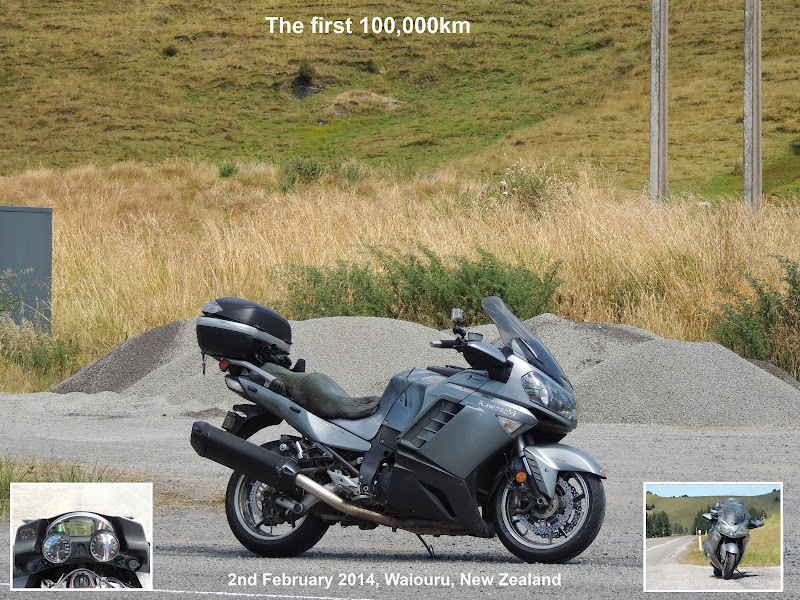 One last gravel thrash caught me up to the guys at Tangiwai and we pottered into Waiouru for an early lunch. After lunch Carl had to leave us - who has business meetings on a Sunday - but Colin and I forced ourselves to go in search of more fun. More marbly gravel and corrugations had me having to stop yet again to sort out the GPS (I see thread-locker in the very near future) and let a bit of Colin's dust settle for me. I also got the chance to start the cameras again and the batteries managed another 20mins or so before giving up. I caught up to Colin at Pukeokau and after a wee chat led him the rest of the way through and back out onto SH1. In Hunterville we stopped for fuel and I removed a (living) bug of some sort from my jacket before Colin informed me that we were not done for the day and led us back through to Turakina Valley again! At one of the intersections on Turakina Valley Road we had another chat and I mentioned a little back road I knew that would get us back into Marton. Taurimu Road was in much nicer nick than I remembered and once out of the bush there were some great views out across the Rangitikei. As I was in front I made an executive decision to make a photo stop. I was even quick enough to catch a picture of Colin in full flight. About two corners later we said a final goodbye to the gravel and pottered on into Marton before heading for SH1. Along the way a nice policeman showed off his Christmas tree but soon realised that he was looking at two well behaved, law abiding motorbicyclists and shut them down again. Now that looks like a fun day, eating dust and all. If the videos didn't give away how dusty it was the dust on the bikes at lunch shows it.